PARENT'S NIGHT OFF means KIDS NIGHT IN!! We will be having another Parents Night Out, this Saturday, May 12th from 6:00pm - 9:00pm! Cost is only $20 for the 1st child & $15 for siblings! 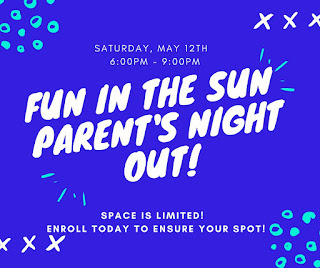 Each kiddo will enjoy the evening making their own craft, jumping, and exploring a new obstacle course through the gym. We do provide dinner for the kids and there is time for open gym at drop off and pick up. Enroll your kids today through the parent portal! Log in or create an account at today. www.wingsgym.com.